I wasn’t interested in reviewing an HD TV until one was available for less than $1000 with built-in HD Digital TV tuner and a Full HD 1080P (1920×1080 pixels) panel which supported at least 100hz so fast moving content could be watched without blurring. While it has some flaws the 32″ inch (81cm) LCD Kogan model 1080P-32 which I’ve had on media loan for review satisfies all these criteria and is sold online for $860.93 ($799+$61.93 shipping). EDITOR: Since writing this review the TV has dropped in price to $599+postage and added two features: an extra HDMI port on the side (now 3 in total) and a USB slot and SD card on the side so you can play movies, music and photos directly from the TV. The 2x HDMI inputs are enough for my Bluray player and separate HD Digital TV PVR to plug into the TV and the 1080P-32’s inbuilt Digital TV HD Tuner is quite handy because it means I can record 2 different Digital TV programs using my PVR and still watch any channel live using the TV’s tuner. Note 1: Free to air HD TV in Australia is broadcast at 720p or 1080i quality which isn’t as high quality as 1080P (the quality of a Bluray movie). Note 2: Buy enough HDMI cables from your local hifi retailer or Kogan to plugin other HD equipment you own such as a Bluray player, Sony PS3 gaming machine, TiVo or PVR. If you use any other cable like Composite or Component to connect a 1080P high definition video signal to your TV than it won’t display at full quality. 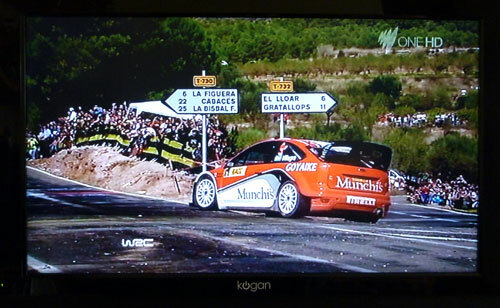 The remote, menu systems and EPG (which can all be seen in the photo slideshow below) are reasonably easy to use. If you’re using the TV’s built-in HD Digital TV tuner it supports subtitles but I think they’re a bit too large. 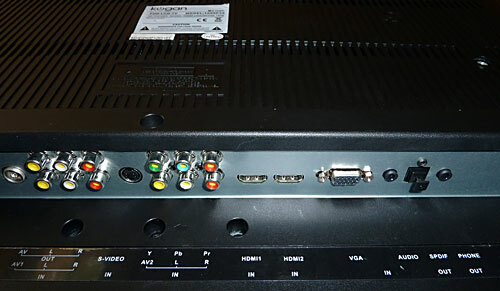 All the HDMI and other input/output connections are at the back of the TV and positioned so you have to plug them in vertically (looking from behind and underneath the TV) which is cumbersome. The 1080P-32 is compatible with any 400mm x 200mm VESA wall mount if you want to place it on your wall rather than on a TV unit using the stand it comes with. However I liked the Energy Saver Power Switch on the back which stops the TV using electricity when turned off (it will otherwise use 2W in standby mode if you turn the TV off using the remotes power button). The 32″ inch (81cm) 1080P panel displays Full HD Bluray movies and HD TV free to air broadcasts at quite good quality with clear details in complex movie scenes albeit not as black as a high end LCD or Plasma TV screen. The panel features a 178 degree viewing angle which is just as good as the big brands and the 120hz Image Processing Engine handles fast motion like Formula 1 cars or running Wildlife in a documentary with little discernible blurring. One of the reasons this TV costs less than $1000 is because it uses fairly mature CCFL LCD technology not the higher quality Plasma (which is usually seen in HD TV’s 40″ and larger) or very new OLED screen technology which would have significantly increased the price. Audio quality from the 2x 10W speakers is adequate most of the time but nothing stellar. If you’re going to watch a lot of Movies or content where audio quality is important than I’d suggest using the TV’s Optical Audio Out to connect to a proper fully featured sound system. One of the ways Kogan cuts costs is to supply all the basic features used everyday and not very new or less used features. Or integration with other Kogan products like their Bluray player so you only need 1 remote control. Is the Kogan P1080P-32 perfect? NO because it takes the classic Kogan approach of being 80% as good as the competition but 66% of the price. If you’re comparing 32″ inch LCD Full HD TV’s than you’ll have come across the Samsung 32″ LA32B650 and Panasonic 32″ TH-L32S10A which both retail for $1300+delivery. You will get more features and better usability from these TV’s if you’re willing to pay over $400 more than the Kogan 1080P-32. It all depends on where you as a buyer fit on the price/value/features spectrum. You can buy the Kogan 32″ inch 1080P Full HD LCD TV With Inbuilt HD Tuner (1080P-32) online for $860.93 ($799+$61.93 shipping). 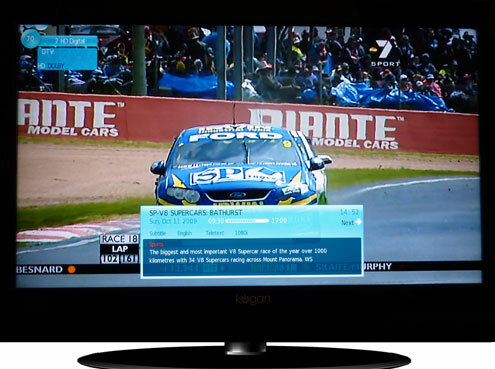 Kogan’s 1080P-32 is a good mid-size LCD television for a budget buyer. It has picture quality good enough to enjoy Blu-ray movies, although you’ll need a separate sound system to really get the most out of them. The reason the cable ports are positioned that way (vertically) is so that it can be mounted flush on the wall! It’s a design compromise but one that makes sense. Also you put the cables in from underneath so the ports don’t fill up with dust! hmm, thanks for the review! I am not at all familiar with Kogan as brand so I’ll really have to look into them. At just 32″ however, its impossible to benefit from the 1080p designation. I’m not sure of the exact publishing date of this article, but it appears to be in 2009. I’d say around mid year it was possible to find a 40″+ for close to 1k. heh, at the very least it is certainly possible today! I have not looked into Kogan brand either but your thorough review makes me want to check it out. What about failure rate. A lot of these cheaper brands seem to burn out quicker than Samsung or some of the more popular ones. What’s your take? EDITOR: Good question. I’ve bought a few Kogan products (TV, Bluray player and netbook) and haven’t had problems with them. Also the product features and build quality have improved a lot as the company has grown bigger. This is the best part of new LCD TVs. It is just so easy now to play movies or wach photos almost directly from PC. I’m using special adapter on my Toshiba to get pictures from my google phone stright to my 32 inch LCD. Kogan HDTV looks like fairly good TV, however prices are a way to high in my opinion! Toshiba or Panasonic are top brands so is worth to pay $200 for their experiance and technology.